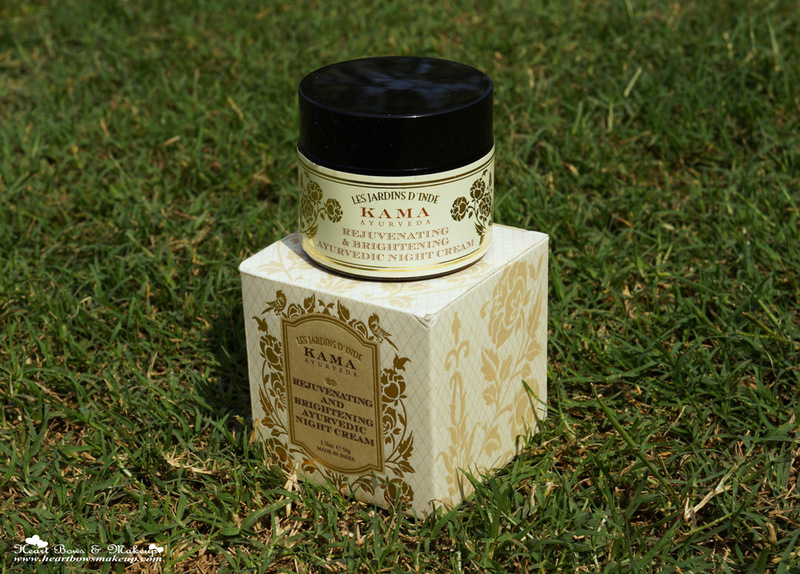 Using a night cream has become an essential part of my skincare routine even since I started using the Kama Ayurveda Rejuvenating & Brightening Night Cream last year. This was the first night cream I had ever used and its still one of my favorites. Read on to know my experience with it. 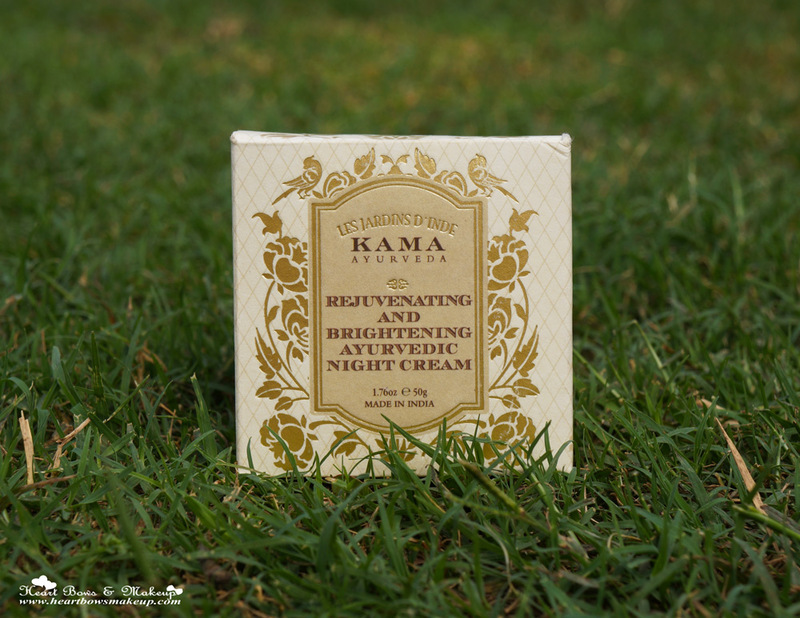 The Kama Ayurveda Brightening Night Cream comes in a gold and cream cardboard packaging which look quite luxurious. The night cream comes in a brown heavy glass jar with a screw on cap. It has a stopper lid which I find a little annoying so I got rid of it. 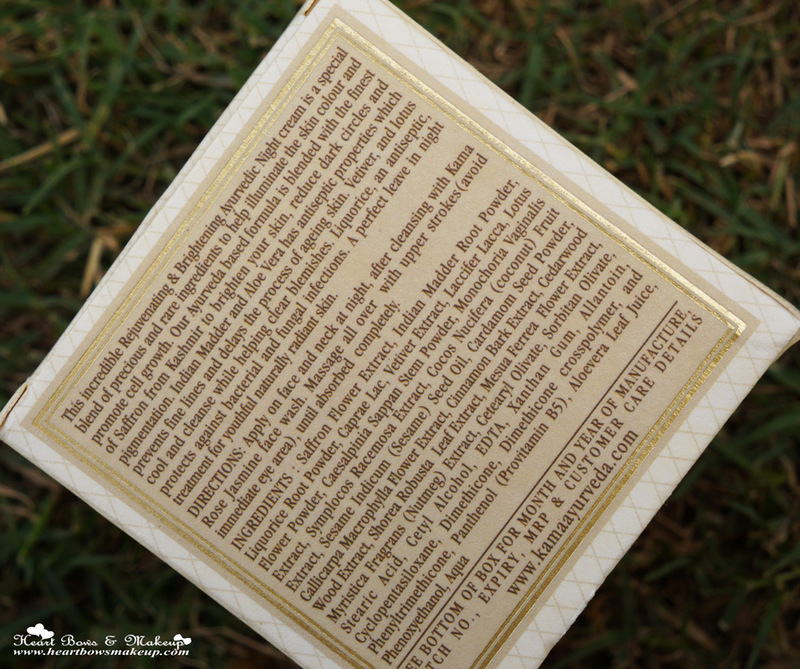 The box mentions all the necessary details like the full ingredient list, date of expiry, claims etc. Overall, I quite like the packaging but I wish it wasn’t made of glass as I am prone to dropping things! 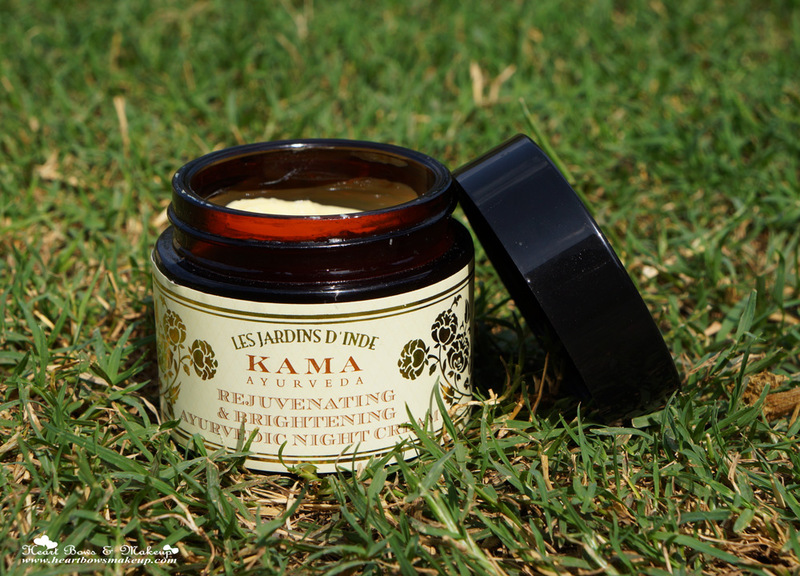 Kama Ayurveda Rejuvenating & Brightening Night Cream is light yellow in color and has a thick, emollient texture. It feels a bit heavy so I tend to moisten my face with a toner before applying it. It spreads much more easily on a moist face but requires a wee bit of massage to get fully absorbed. Generally, night creams are a bit rich in texture hence I do not mind this aspect. 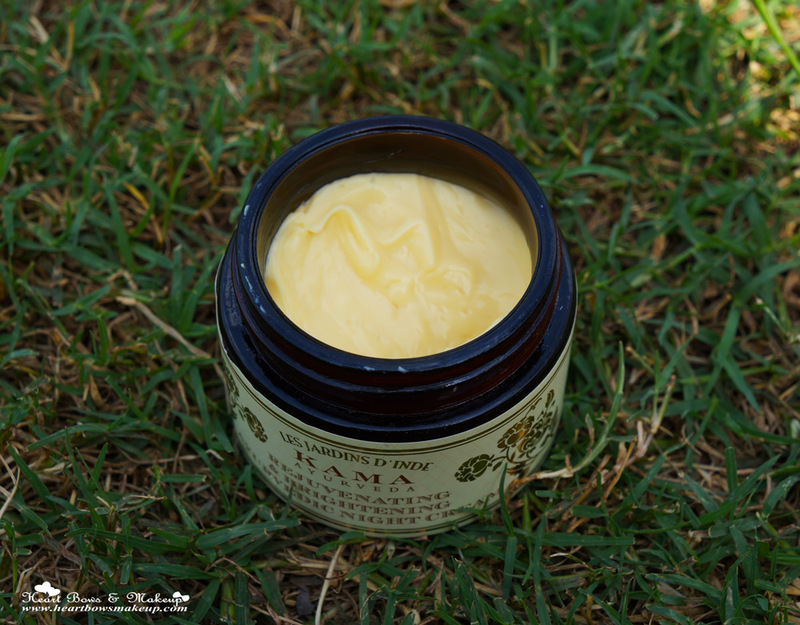 Despite being so rich and creamy, the Kama Ayurveda Night Cream does not make my face greasy. I have combination skin (which leans towards oily in summers) and I can see why they claim it to suit all skin types. This will adequately moisturize dry skin while oily skinned beauties won’t have to worry about their face feeling greasy! The night cream made tall claims of brightening the complexion, reducing dark circles and leading to a youthful skin. Well, it certainly does nothing to reduce pigmentation or dark spots but it considerably improves the texture of your skin. 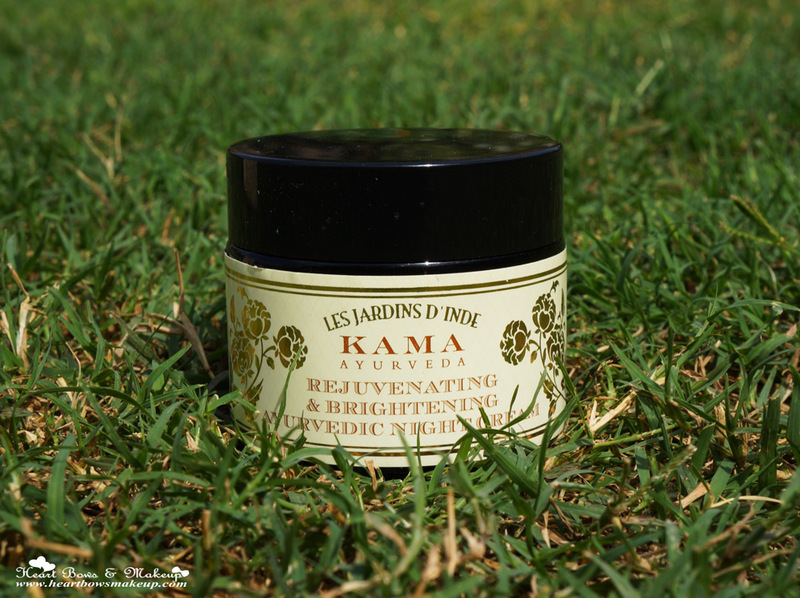 Last year, I was facing a huge issue with my enlarged pores and the Kama Ayurveda Brightening Night Cream really improved the texture of my skin. It made my skin quite soft and supple to touch while reducing the size of my pores! As long as you don’t expect it to reduce dark spots, I’m sure you’ll love the way your skin will feel after using it. At first I felt the cream was a bit expensive but the first jar lasted me 4 months and I believe that is quite affordable for a natural and ayurvedic product which contains such beneficial ingredients. 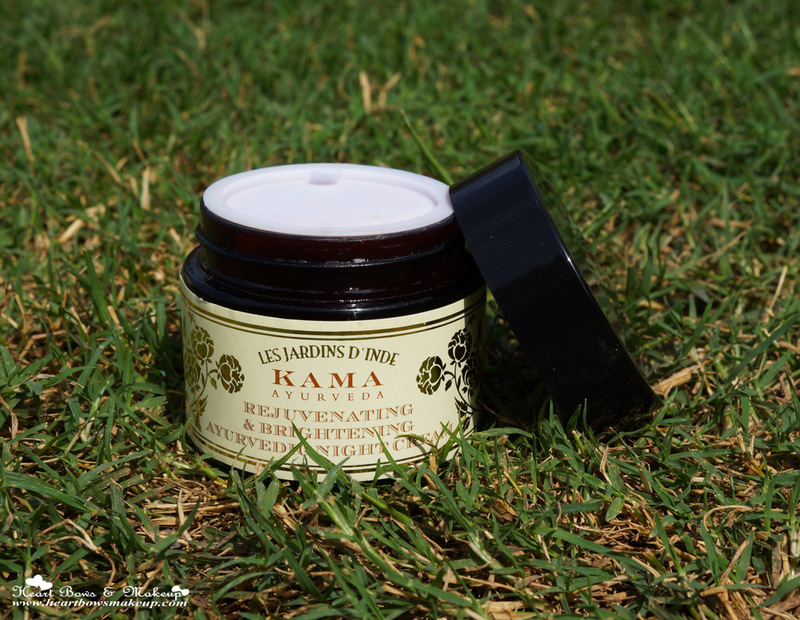 HBM Recommendation: Kama Ayurveda Rejuvenating & Brightening Night Cream is a rich and emollient cream which hydrates the skin yet feels quite lightweight once it is absorbed. It did not break me out or feel too heavy for my combination skin. The cream really improved the texture of my skin and made it much more softer to touch. However, it did not deliver on the claims of brightening the complexion or reducing dark circles which is a bit of a bummer(hence the low rating). However, despite that it is my favorite night cream as it delivers on everything I expect from a good night cream and I do recommend it if you’re on the lookout for a decent night cream in India. *PR Sample. However, my opinion is honest and unbiased.